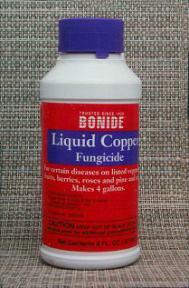 Safer to use than most other fungicides on the market, Liquid Copper works on almost all commonly found harmful fungi. Through years of use at our nursery, we have found it to be effective and easy to use. We suggest diluting to one-half the recommended concentration. (As a caution, all insecticides and fungicides, even those which are naturally derived, should always be handled with care).